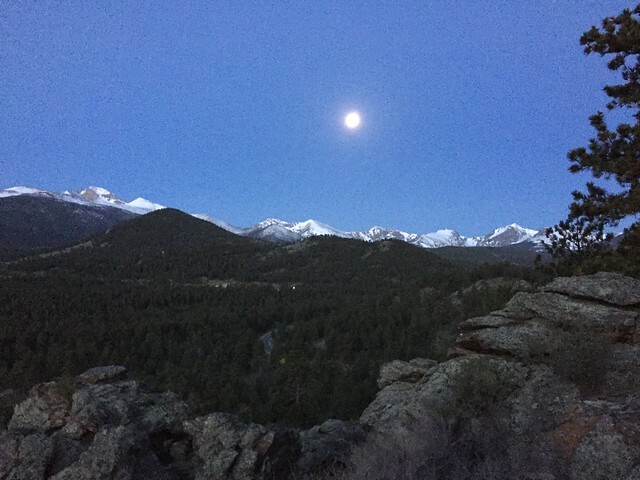 We set out from the YMCA of the Rockies at 4:15 AM, a single headlamp and a vague sense of direction among the ten of us. We walked due north for a mile, knowing that we needed to find a bridge across the raging waters of the river. But the trees and the hulking shadow of the mountain quickly overwhelmed us and confused us. I was supposed to be one of the knowledgable ones, one of the experienced ones, a leader. But in truth, I was the blind leading the blind. We wandered downstream in the dark until it became clear that we had missed our turn. 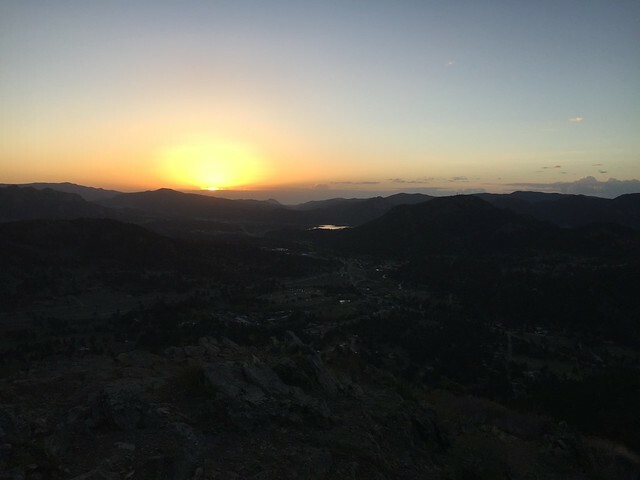 We found ourselves walking along a highway toward downtown Estes Park instead of climbing a trail to watch the sunrise. We swung our headlamp back the way from which we came and walked upstream, hoping to find the bridge. After about half an hour of mounting anxiety, we found our bridge and started climbing the mountain. The ascent was more difficult than we had expected. Our lungs and legs were not yet acclimated to the altitude. The group got strung out, some racing ahead, some straggling behind. One person said she was starting to feel light-headed, and then she stopped to rest — sitting down directly on top of a cactus. The clock kept ticking, closer to the sunrise we were all hoping to see on the opposite side of the mountain. Fortunately, we worked things out together. About half of the group decided to stay at a picturesque rock formation, about half-way up the mountain, with a view up the valley where they could enjoy a different view of the sunrise. The rest of the group pressed onward, straining against gravity, breathlessness, and weary muscles. A dozen false summits promised us deliverance from our pain, but at 5:38 AM — precisely the moment marked out as sunrise — we reached the top of the mountain and soaked up the view. It was magnificent. Transcendent, even. We fought through challenges. We worked together. We enjoyed the process and reveled in the reward together. And then we descended the mountain together, walking back into camp for the first day of our summer Leadership Training program. This entry was posted in H2O Kent, Introspection, Leadership and tagged #EPLT16. Bookmark the permalink.